Welcome to technical-textiles.net. Membership gives you access to the web’s most comprehensive range of news and feature articles in the world of performance textiles and nonwovens. Join now and to keep up-to-date with all the latest developments in materials, technologies, processes, patents and research, market and company news. 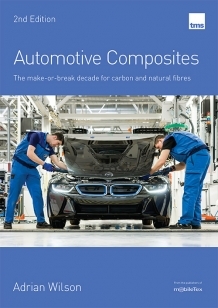 This updated 2nd edition reviews the use of composites in the automotive sector and assesses how far these materials are from being used in mass vehicle production. Written by Adrian Wilson, this in-depth report, with around 220 pages more than 60 tables, provides a sustainable roadmap for the automotive composites industry for the next decade and beyond. It includes detailed analyses of the production and markets for carbon fibres, glass fibres and natural fibres, and profiles of leading suppliers of these input materials. Click here to join FREE for access to news headlines and a fortnightly enewsletter, or choose a paid membership for full access. Please find below the list of forthcoming conferences and exhibitions on technical textiles and nonwovens.